French is both a working and an official language of the European Union, the United Nations, UNESCO, NATO and other legal entities and governing bodies. The language is spoken on five continents, which makes it a truly global language. Yet if you do not live in a country where the language is spoken, you will probably not hear or read it often. This is in sharp contrast to English, which is an ever-present feature of daily life. Once you have learned French, you have to continue to use it actively, or—at the point when you need it—do a quick refresher course. That is why a range of French courses are offered. When trying to navigate your way through the maze of French training courses found out there, it is especially important to be clear on what you want before you start looking. Are you learning French as a hobby or because you like the idea of being able to speak French should ever it be necessary? Do you perhaps you have a clear goal in mind for which you need to speak French? For the first example, you could choose to take weekly French lessons in a group setting. This is both practical and pleasant, and you slowly but surely work your way towards improving your French language skills. You follow a pre-determined path that many have followed before you. Language Institute Regina Coeli may not be the right choice for you. In the second example—when you have a clear goal in mind—it is better to choose a different kind of French course. You know what you want, so of course you want to take the best and fastest path to your goal. That is something that cannot be done alone. You have to know how to properly navigate to get to where you want to go, and before you know which route will work best, you need to know your starting point as well as your destination. Choose an individual training programme. Every training participant has a different starting point, a different goal and develops his or her own communication style. Do not allow yourself to be distracted by other learners and be sure to keep the learning pace up. Take lessons from native speakers and do not study using only books or online resources. Language is learned best when it is taught by those who have grown up with it. Only native speakers have truly mastered the finesses of the language and can impart that knowledge. Choose a course which fits your learning style. You will not only learn faster, but you will also enjoy it more. We meet you at your starting point. We determine your current level, decide where you would like or need to go, and advise you on the best approach and path to your goal. This all takes place during your personal intake appointment with a trainer. This conversation is essential for determining your lesson programme. We therefore invest a great deal of time in it. A team of trainers coaches you along your journey. You receive explanations, you practice, you are encouraged, and if they see that your route or goal needs to be fine-tuned, they do so immediately. Along your journey you will find various ‘substations’ where all your needs are met and which support you in continuing on your mission. You want for nothing while attending a course at Regina Coeli—everything revolves around you learning French. Our institute is fully designed to support the process of learning a foreign language. It is wonderfully serene and you are well-cared for. Once you have reached your destination, we will bid you farewell, but you can always return for additional support. Should you need help, we are always at the ready. This personal navigation is what we mean by tailor-made courses. Our business French courses are worthy of a special mention. Even if you already speak French fluently, as a non-native speaker it is not an excessive luxury to deepen your knowledge of both the French language and business culture. Doing business in French means building a relationship in French. What are the French sensitive to? What kinds of things should you not say? How can you persuade them? What kind of language do you need to do so? There are no simple tricks you can learn for this; you have to learn it by interacting with the French. The language is therefore essential in this regard. It is crucial to receive training from native speakers when taking a business French course, and preferably from people with experience in the French business world. They are your best choice when it comes to practising real-life scenarios and giving you the right feedback. Let us be candid: a course consisting of private lessons is more expensive than group or online lessons, but you get and learn so much more in return. You learn exactly what you need to learn. In addition, you get the opportunity to develop your own personal style, just like in your mother tongue. This alone pays for itself, whether in terms of professional success or in the confidence gained when communicating in French. And if you are going to invest in yourself, choose an institute where you know the quality is consistently high. 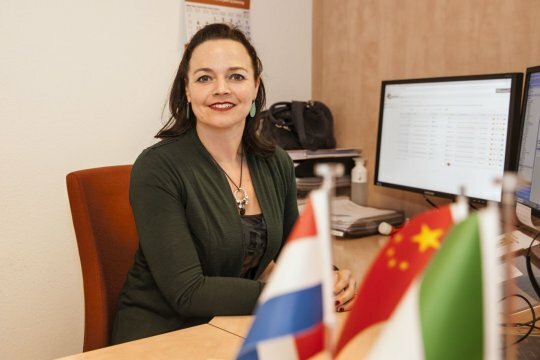 Language Institute Regina Coeli has been the best training provider in the Netherlands for years, and our language courses are highly rated by our participants. May we help you, too, improve your French? Être and avoir are the verbs that are most used in the French language. Both are irregular and turn up in many different forms. It is hardly surprising, then, that anyone learning French has a tough time learning how to use them correctly.